Sinonasal teratocarcinosarcoma (STCS) is a rare, morphologically heterogeneous and highly aggressive tumour of ambiguous origin. It is characterized by the presence of benign and malignant epithelial, mesenchymal and neuroectodermal components. Because of their rarity and heterogeneity, these lesions are often misdiagnosed, leading to management difficulties. Adequate sampling with a high index of suspicion is needed to diagnose this rare tumour. We reported here a 48-year old man with right nasoethmoidal mass eroding the cribriform plate with intracranial extension. An initial incisional biopsy was performed and a diagnosis of craniopharyngioma was made. Subtotal endoscopic excision of the mass revealed features of STCS. Immunohistochemistry confirmed the same. The patient was subsequently treated with radiotherapy. The histogenesis, histopathological features, immunohistochemistry findings, clinical features and treatment were discussed here. Till date, there are less than 100 cases reported in English literature. Carcinosarcoma of the paranasal sinuses. Pathology 1983; 15(4): 413-9. 2. Heffner DK, Hyams VJ. Teratocarcinosarcoma (malignant teratoma?) of the nasal cavity and paranasal sinuses, a clinicopathologic study of 20 cases. Cancer 1984;53(10):2140-54. 3. Budrukkar A, Agarwal JP, Kane S, Siddha M, Laskar SG, Pai P, et al.Management and clinical outcome of sinonasal teratocarcinosarcoma: single institution experience. J LaryngolOtol 2010; 124(7): 739-43. 4. Smith SL, Hessel AC, Luna MA, Malpica A, Rosenthal DI, El-Naggar AK. Sinonasal teratocarcinosarcoma of the head and neck: a report of 10 patients treated at a single institution and comparison with reported series. Arch Otolaryngol Head Neck Surg 2008; 134(6): 592-5. 5. Batsakis JG, El-Naggar AK, Luna MA. Teratomas of the head and neck with emphasis on malignancy. Ann OtolRhinolLaryngol 1995; 104(6): 496-500. 6. Yang S, Sun R, Liang J, Zhou Z, Zhou J, Rui J. Sinonasal teratocarcinosarcoma: A clinical and pathological analysis. Int J Surg Pathol 2013 ;21(1):37-43. 7. Pai SA, Naresh KN, Masih K, Ramarao C, Borges AM. 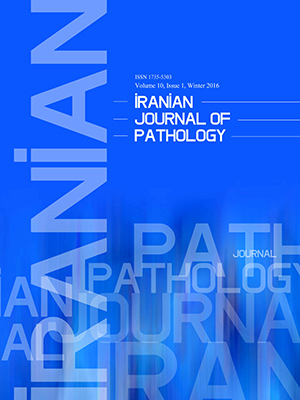 Teratocarcinosarcoma of the paranasal sinuses: a clinicopathologic and immunohistochemical study. Hum Pathol 1998; 29(7): 718-22. 8. Kane SV, Karpate AA, Bal M, Juvekar SL, Pai PS. Chemotherapy-induced neuronal maturation in sinonasal teratocarcinosarcoma- a unique observation. Head Neck Pathol 2009; 3(1): 31-6. 9.Misra P, Husain Q, Svider PF, Sanghvi S, Liu JK, Eloy JA.Management of sinonasal teratocarcinosarcoma: A systematic review. Am J Otolaryngol2014;35(1):5-11.